김유신이 압량주 군주로 있을 당시 군사 훈련장이었다고 전해오는 유적이다. 압량리, 내리, 선화리, 두룩산 유적으로 구성되어 있으며 야트막한 언덕에 자리잡고 있다. 유적은 서북쪽의 구릉지대에 높은 대를 쌓은 고대식 광장과 동남쪽에는 무덤처럼 흙을 쌓아올려 높은 대를 만든 토축 고대가 연결되어 있다. 고대식 광장은 거의 원형이며 평탄한 넓은 장소를 광장으로 하고있다. 광장은 병사들이 무술을 익히고 심신을 연마하던 장소로 보이며 토축 고대는 장군의 지휘장소로 보인다. 자연구릉상에 흙을 쌓아올려서 마치 성처럼 보이지만 성으로 보기에는 규모가 작으며, 윗면이 평탄한 광장으로 되어있는 것으로 보아 군사훈련장으로 보여진다. 다만, 토성을 훈련장으로 이용하기 위해 고쳐 쌓았을 가능성도 있다. This historic site was used as barracks for soldiers when Kim Yu-sin was the governor in Amnyangju. These are the ruins of Amnyang-ri, Nae-ri, Seonhwa-ri, and Duruksan Mountain. 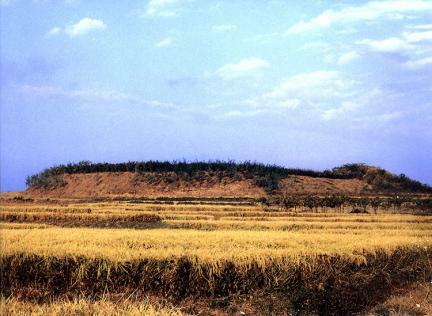 The remains consist of an ancient-styled drilling ground constructed on a high elevation on the northwest hilly districts and a high post built of piled up earth like an ancient tomb in the southeast. The training ground and the post are connected to each other. The parade ground is in an almost circular shape with a broad flat area. The drilling ground would have been used for training soldiers and the high earthen post is thought to have been a place of command for a general or other officer. The ruins look like a fortress due to being constructed of clay on the naturally hilly districts but they occupy a small area in for a fortress. However, some scholars suggest the possibility that the original clay-built fortress was changed into a training ground.